Follow Jesus on a faith-full fishing trip this Lent with The Disciple Ship! Press out this easy-to-assemble fishing boat and put it on display. Each day, a small “fish” taken from the boat instructs children how to live as Jesus’ disciples. 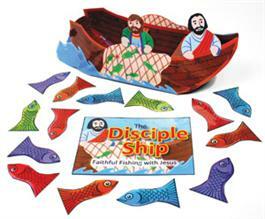 A daily Bible verse and activity starter are printed on each of the 40 fish-shaped cards. Children of all ages will enjoy the message that we show that we are Jesus’ disciples by the loving things we do for others. A great way to focus on discipleship any time of the year. Pick up your free Disciple Ship in the Godly Play room! « Messiah in the Passover — Mark your calendar!